The IAVCEI 2017 Scientific Assembly will be held in Portland, Oregon, U.S.A, from the 14th to 18th of August, 2017. On behalf of IAVCEI, the Organizing Committee invites the international scientific community to participate in the IAVCEI 2017 Scientific Assembly. The main theme of the conference will be “Fostering Integrative Studies of Volcanism”. Following tradition, the conference will cover the complete range of IAVCEI research interests, ranging from planetary volcanology and chemistry of the Earth's interior to eruption dynamics, and will also include a practical understanding of the environmental and social impacts of eruptions. In addition, in keeping with the theme, the meeting will explore and nurture thinking that integrates the breadth of sub-disciplines. We anticipate programming in which our younger colleagues and those from developing countries will thrive. The scientific program will include symposia covering a broad variety of volcanological fields with plenary speakers emphasizing integrative and intersecting themes. In order to meet the needs of abstract submission and conference, workshop, and field trip registration, we collect various types of information that are gathered through the submission forms. The information we collect are provided voluntarily by you. We do not share, sell, or rent any personal data submitted by visitors to any of our websites to any third parties. 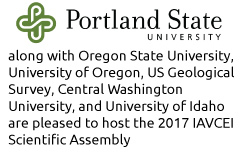 Collected data are solely used in the organization of the IAVCEI 2017 Scientific Assembly conference to be held in Portland, Oregon August 14-18, 2017.